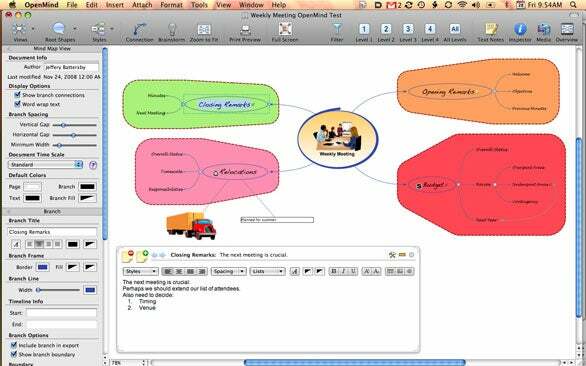 There is currently no dearth of mind mapping applications available for the Mac, which means that you have many—quite possibly too many—choices when it comes to selecting a mind mapping product for your personal or business use. But Matchware’s recently released OpenMind 2 offers features that aren’t available in a combined handful of other similar products for the Mac, making it a compelling choice for personal, business, or educational use. At its heart, mind mapping—or webbing an idea, if you work in educational circles—is really nothing more than creating a free-form outline: a way of organizing ideas and information without the rigid, linear strictures of a standard outline, and getting your thoughts down on the page quickly without worrying about exactly where a particular idea fits into the overall structure. Mind mapping has the added benefit of giving you a broader view of your ideas than you might otherwise have in the hierarchical structure of a typical outline. A new OpenMind document begins with a central idea, theme, or hub from which branch a multitude of sub-ideas. For example, if you’re preparing a report about the presidents of the United States, your central idea would be U.S. Presidents, with main branches for each of the presidents, such as George Washington, John Adams, Thomas Jefferson, and so on. You can then create sub-branches for each of the presidents with specific biographical information, like birth and death dates and other important topics. Adding a branch is as simple as pressing the return key and then typing a name for your new branch. You can add sub-branches, or twigs, by holding down the option key and pressing return; you can also double-click any existing branch to create a new sub-branch. Once you’ve finished brainstorming, you can rearrange anything on your map via drag and drop. Have some presidents out of order? All you have to do is drag them to the appropriate position on your map. Accidentally make something a twig that should have been a major branch? Drag the topic to where it belongs and it, along with all of its sub-branches, will be promoted appropriately. In short, I found the entire process of creating and editing my mind maps to be quick, easy, and intuitive. OpenMind also lets you link a multitude of objects to anything in your mind map, including but not limited to Word, Excel, Pages, and Numbers documents, Flash files, hypertext links, and audio and video files. This makes it possible to use OpenMind as a repository, similar to programs like DevonThink ( ), for all the files and documents associated with your mind map. OpenMind’s extensive features let you create, edit, and update your mind maps, and make it easy to move your brainstorming sessions to Word and Excel. OpenMind lets you display your information in a number of ways. You can use the default mind map view, or choose top-down, left-to-right, outline, or timeline views. Missing from the Mac version is a Gantt chart view, a feature that’s available in the Windows business version; Matchware says that it’s waiting to see if there’s a demand for it on the Mac. Meanwhile, OpenMind’s timeline view allows you to add start and end dates to anything in your map and have it appear in order in a timeline. So, in the case of our presidents, if you were to add the dates of their presidential terms, the timeline would display each president from left to right in the order that they served as president. But it’s OpenMind’s outline view that holds the key to the program’s “little secret” and propels the program past most others of its kind on the market. While mind mapping isn’t necessarily a linear process, every time you create a new branch off of your central theme, OpenMind maintains a standard linear outline in the background. Switch to outline view and you’ll see a list of every new idea you’ve created in the order you created it. While several mind mapping apps give you the option of viewing your map in standard outline format, OpenMind uses this outline as the foundation for exporting your data to Microsoft Word ( ), PowerPoint ( ), RTF, image, or HTML formats. The documents OpenMind produces are of excellent quality—the kind you won’t be embarrassed to post on your Web site, use as a business presentation, or hand out at the end of your seminar. In other words, you get business-class documents at the click of a button, and all based on your original mind map. Matchware’s OpenMind 2.0 is a powerful mind mapping application that’s very flexible and versatile, yet simple to use. And its capabilities extend well beyond its own borders, making it easy to move back and forth from your initial brainstorming sessions to business presentations and professional documents with amazing ease.